One of our best selling displays! 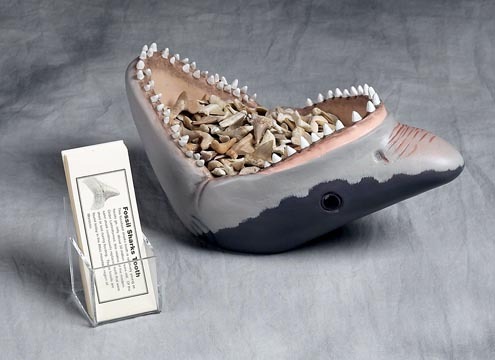 Made from Poly-resin, this Shark Head display measures 10"W X 6"H, comes with 150 pieces of our $1.00 Fossil Shark Teeth, and includes information cards with holder. 10 free shark teeth are included to offset the cost of the display. The Shark Head Display alone can be purchased separately for $30.00 if you have purchased teeth in the past.